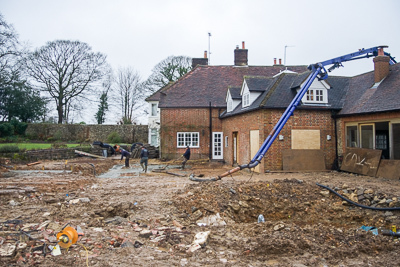 This time last year I was finalising details for the start of a large landscaping project just outside Petersfield (and handily, only 5 minutes from my office!). Then bang on time, straight after New Year, the work started. And then it rained solidly for 3 months! Not that it stopped our indomitable team of landscapers (from PC Landscapes based in Farnham) who struggled through lashing rain, howling winds and revolting clay to create a brand new garden ready for us to plant in April. My clients had moved into the house shortly before, and major renovations were underway as we started the garden landscaping. 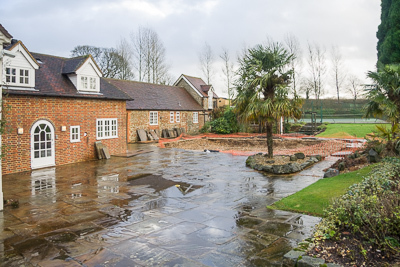 The primary objective of the garden design was to remove an enormous swimming pool (and its tropical rockeries! ), and to reduce and break up the vast swathes of Yorkstone paving at the rear of the house. 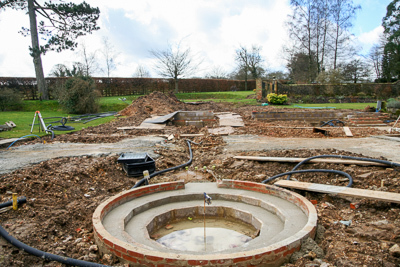 The first stage of work was to fill in the swimming pool and start to create separate areas of terracing around the house. 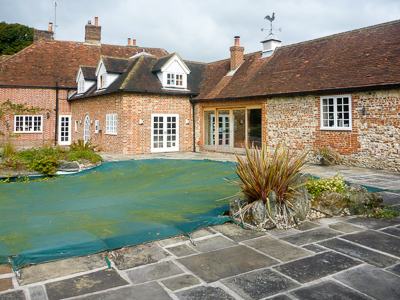 My plans involved partially using the in-filled swimming pool as a gravel garden (to aid drainage of the terraces) with a sunken pool in the middle, and breaking up the paving with small areas of lawn and planting beds. Having designed the rear terraces all on one level, plans were changed at the last minute when it was decided to drop the floor level inside one section of the house. Although a pain at the time, the design change meant that the terrace could be divided further, with steps and small retaining walls between the different levels, making it altogether a more interesting and dynamic space. 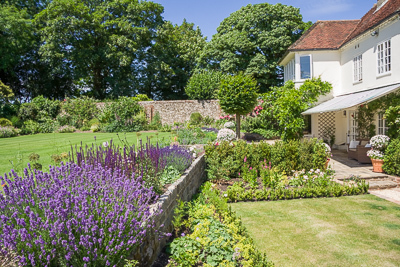 It’s often the case that the design of a garden changes as the landscaping progresses, so it’s important to be willing to adapt ideas, and often – as in this case – the changes can be an improvement on the original concept. 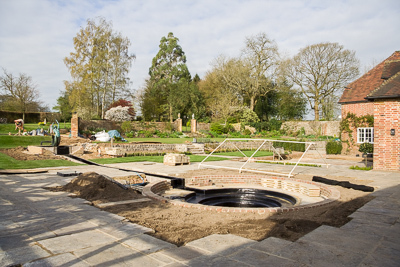 The main focus from the living room is now a raised pool with a stepped rill which runs through the gravel garden to the circular sunken pool. My client’s pride and joy, his mermaid, sits happily in the raised pool. 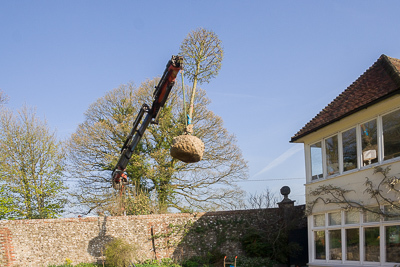 The planting of 3 large specimen Hornbeams was one of the most nail-biting moments of my career (with the trees being craned over the garden wall and into position in small planting beds), but I think it really paid off as they add instant height to another section of terrace, and frame the view from the drawing room into the garden. Box hedges help to disguise the fact that the 3 sections of terrace (like the 3 parts of the house), are all at different angles and pretty much nothing in the existing garden lined up! 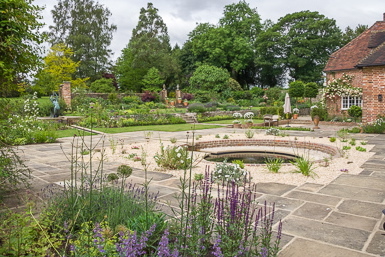 The plants used around the house are predominantly perennials which can cope with the site conditions – very heavy clay in some areas, but better soil in the existing borders around the upper lawn. Being a keen gardener, my client also added lots (and lots!) of annuals which added instant colour and flowered all summer long. Within a few weeks the garden looked like it had been there for years. The gravel garden allowed me to include plants which enjoy good drainage and hot sun. 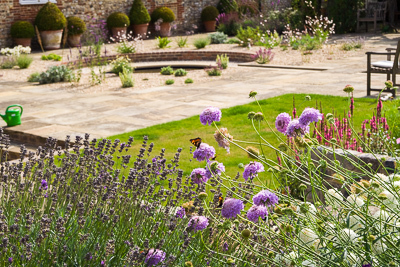 This meant I could put in a greater variety of plants to attract butterflies – something high on my clients’ wishlist. Garden lighting is a critical element in any landscaping design so on this occasion I decided to bring in the experts (Owl Lighting based in Alresford) to design a scheme for us. Lights have been used sparingly to illuminate steps, the pools, the rill and the mermaid and our standard trees. We are adding more lighting (and sculpture) to the upper reaches of the garden over the next few months as the landscaping extends away from the house. It’s been a fantastic (and challenging) project to work on this year and I’m really looking forward to doing more in the near future with these clients as they are full of ideas and enthusiasm for their new garden, and that in itself is a real pleasure to see. 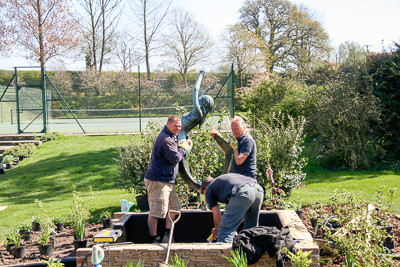 You can see more pictures of the garden build (from start to finish) by clicking here. What a stunning garden! I love the splashes of colour, and the two pools connected by a narrow channel remind me of the Moorish gardens in Andalucia, such as in the Alhambra (although their pools were always rectangular). So interesting to see the process from start to finish. Thanks Fiona! 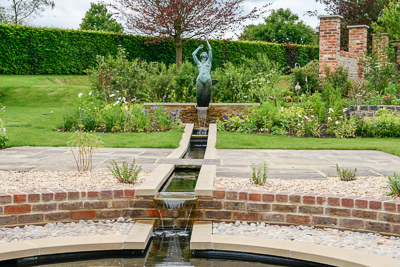 The rill was partly built for the dogs to cool off (and of course to look stunning! ), rather than trying to bring a Moorish influence to rural Hampshire (! ), but there’s no denying that putting running water in a garden really adds something. Glad you found it interesting. Amazing … You are VERY clever .. It is inspirational. Very kind of you to say so. It was great to have such a nice project to get my teeth into. I love a challenge!